So...Where Did Stanley Cup Champion Marc-Andre Fleury Go? Home/Featured/So…Where Did Stanley Cup Champion Marc-Andre Fleury Go? So…Where Did Stanley Cup Champion Marc-Andre Fleury Go? In 2009, Marc-Andre Fleury was on top of the world. Fleury was finally a Stanley Cup champion, having backstopped the Pittsburgh Penguins to their 1st Stanley Cup championship since 1992. At this point in his career, he owned a 111-85-26 record with a 2.87 GAA, .906 SV%, and 15 shutouts in the regular season. While those numbers may not seem spectacular, Fleury at this point in his career always found a way to raise his game in the playoffs. After the 2009 playoffs, Fleury had a 31-18 record with a 2.45 GAA, a .916 SV%, and 3 shutouts. His playoff winning percentage of .633% was better than Hall of Famers Patrick Roy, Martin Brodeur, and Eddie Belfour. Those 3 goalies are 3 of the 4 winningest goalies in NHL playoff history. So that’s some big company. What the heck? I thought that once a goaltender won a championship, they figured out how to handle the stress of the playoffs. Instead, Fleury has regressed to the point that memes such as this are popping up to describe his play. And it’s not like the defense has gotten significantly worse. In 2010-2011, just 2 seasons ago, Fleury ranked 7th in the NHL in Defense-Independent Goaltender Rating, a metric that adjusts for how bad or good a team’s defense is. That proves that regardless of the defense in front of him, Fleury posted the 7th best save percentage. So let’s take a look and see if maybe there is something that Fleury is doing differently with his positioning or movement, or if this is just something mental that has gotten into his head. Well…what I was going to do was go back and show you how Fleury is playing positionally different than he does in the regular season. I wanted to find tape on how Fleury’s glove is hanging low, or his stick isn’t flat on the ice, or that he isn’t playing sound butterfly technique. Instead, I found a series of mental errors that have cost his team some enormous goals. I mean seriously? 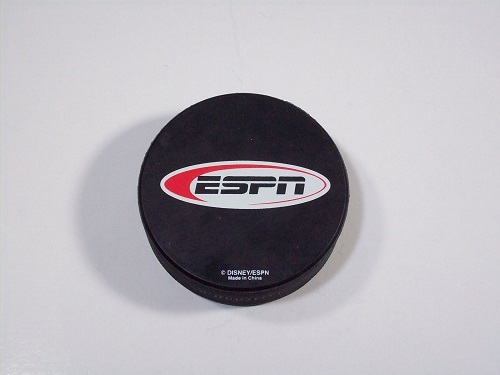 Sure goaltenders mishandle pucks. We saw Martin Brodeur do it in the 2003 Stanley Cup Finals. But that was one time on the big stage. Fleury? Lately, we’ve been seeing it game after game. This is simply inexcusable for a goaltender of his caliber. 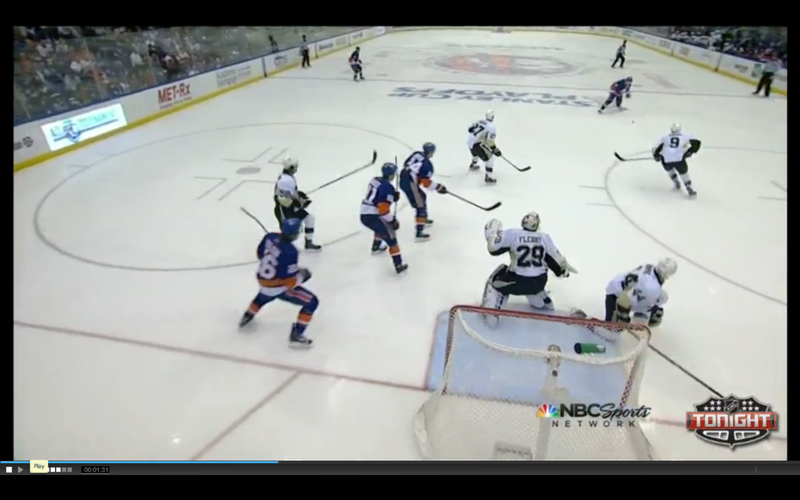 Again, what the heck is Fleury thinking here? How does he let this happen? He knows the dimensions of his pads, he knows where the post is, he can clearly see the puck. So what gives? These are careless mistakes that most junior goaltenders will not make. Fleury has just stopped the first shot and is tracking the rebound as it makes its way out to the point. 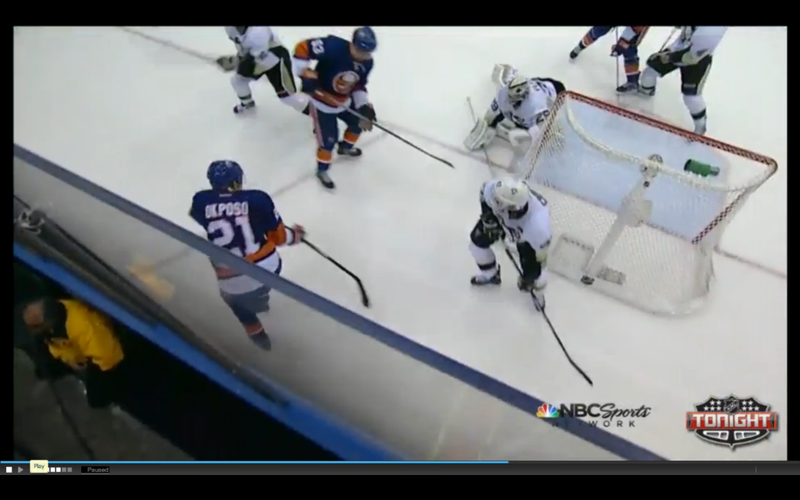 Fleury is back on his feet and is watching as New York Islanders‘ defenseman Mark Streit winds up for the shot. 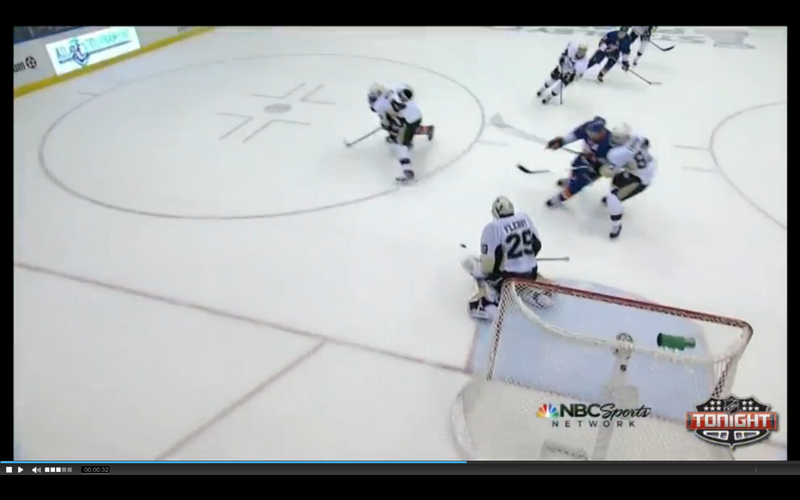 The first mistake here is that Fleury is not even close to being in proper position. Per the butterfly technique, a goalie should be on their knees, with their shoulders square to the shooter, and completely motionless in the instant prior to a shot being fired. Fleury is nowhere near any of that. 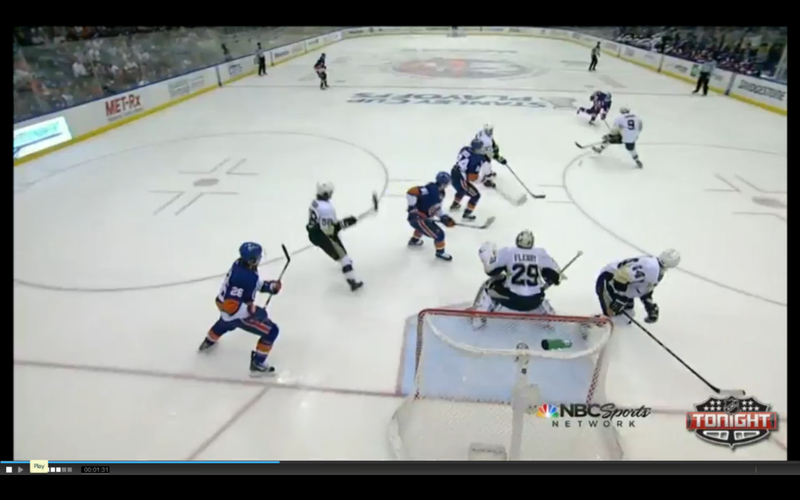 The shot has been fired by Streit and Fleury is still standing straight up, nowhere near being in proper position. Unacceptable. I just don’t understand this. Fleury gets caught between two moves…and falls down. Yes bad things happen. 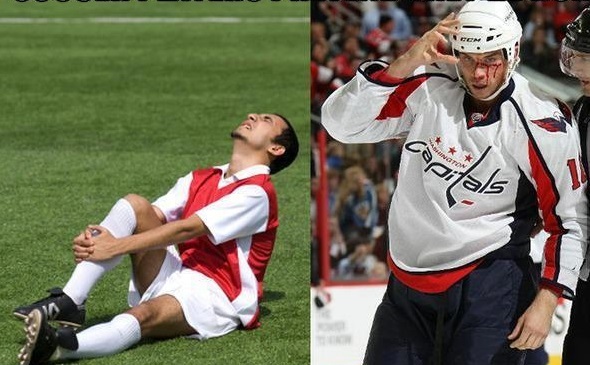 Yes a goalie’s skate can get caught in a rut and they can fall down. However, there is no excuse for it in this situation. Fleury makes a routine save, watches the rebound travel 55 feet out to the point and in that time makes ZERO effort to get ready. Where is the urgency? 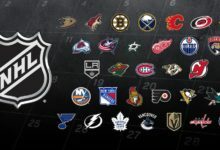 This is the NHL playoffs! Fleury makes the initial save here. No problem at all. He’s exhibiting good butterfly technique and makes a solid save. Fleury gets turned around as his defenseman runs into him. Again, we still have no problem here. All Fleury has to do is find the post and re-establish position. I’ll give you a hint – THAT’S NOT WHAT HAPPENED. Oh that’s right – Fleury just stays put. He doesn’t even bother getting his left pad up against the post to prevent a shot to the front of the net. Fleury literally just stays in the crunched position. Some of you may argue that Fleury didn’t have enough time to get back into position. I’m not saying that Fleury should have been able to completely recover, just that he should have been able to get his pad back into position and recover the post. Again, this is just a lack of urgency and it is inexcusable in the playoffs. I don’t really know what to say anymore. I don’t want to trash the man because he’s a Stanley Cup champion. His 2008 and 2009 Stanley Cup playoff runs were incredible. In those two playoff seasons, he posted a 30-14 record with a 2.31 GAA and a .920 SV%. 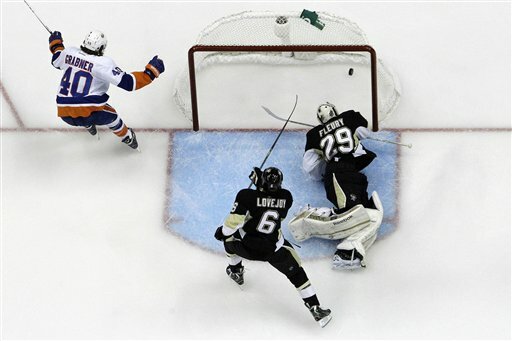 We saw Fleury make some incredible saves, one of which is shown below. It’s just appalling to me that a man of his talent, of his caliber, can lose focus in the most crucial moments, after he already figured out the level of concentration it takes to win the Stanley Cup. In my honest opinion, I believe that Penguins’ coach Dan Bylsma needs to give Tomas Vokoun a shot. Vokoun has very limited playoff experience, having played just 11 games, with his last appearance occurring in the 2007 playoffs. However, in his 11 playoff games, Vokoun has proven very worthy, posting a 2.47 GAA and a .922 SV%. Maybe if Fleury sees that he can’t keep his job with his current level of play, he will take some time to figure out exactly what it is that is preventing him from playing at his highest level. A great role model to reach out to would be former Calgary Flames‘ netminder, Mike Vernon. 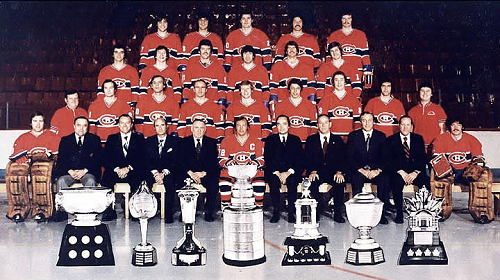 Like Fleury, Vernon tasted his first championship early on, winning the 1989 Stanley Cup in just his 3rd playoff run. 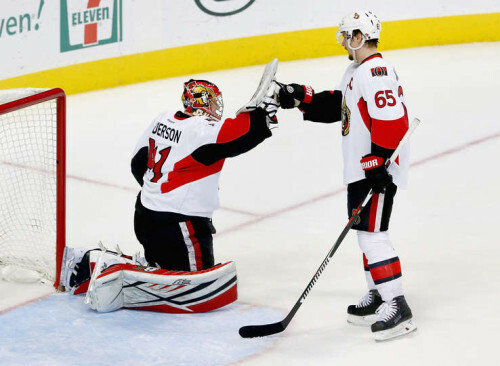 Vernon went 16-5 with a 2.26 GAA and a .905 SV% in that playoff run. At the end of the 1989 playoffs, Vernon’s playoff stats were: 34-21, 2.87 GAA, and a .890 SV%. The next 4 playoff seasons saw Vernon go 9-12 with a 3.38 GAA, and a .881 SV%. Look familiar? Vernon was even known for giving up soft goals in the playoffs. Vernon was so bad in the playoffs that the Flames finally decided that TREVOR KIDD was a better option and dealt Vernon to the Detroit Red Wings, despite Vernon having won 248 games in his Flames’ career. Vernon managed to resurrect his career in Detroit, leading the Wings to two Stanley Cup Finals and 1 Stanley Cup in the next 3 seasons. Hopefully it doesn’t take a trade for Fleury to find his game. Hopefully, being benched for a game or for a playoff run is more than enough for him to recognize that he has to find his game in order for his team to be a true threat for Lord Stanley’s Cup. We know that he has that kind of ability in him. It’s put up or shut up time Mr. Fleury. Will you be remembered as a one-hit wonder that just got lucky? Or will you be remembered as one of the best goalies of your generation? The decision is not final as of this moment, but if you keep up your current level of play…it’s safe to say that we will remember you as the one-hit wonder.